RancherMan & I have a small apiary. The bees are fascinating creatures & invaluable in making sure my garden gets pollinated. Plus they offer up that sweet delight during our summer honey harvest as well. Around our area of NE Texas the honey harvest is usually done the first week in July. But we don’t simply decap the honeycomb to get to the honey. We go ahead & scrape the frames down. We extract the honey and then turn our attention to that gorgeous natural beeswax! After all the honey has been removed from the honeycomb we gather the wax into a large bucket. I cover the wax with water and swish it around a bit. Then I pour the water out through a small sieve to catch all the wax bits. This cleans out much of the sticky honey that’s still clinging to the wax. Oftentimes I’ll do this a couple of times to get as much of the honey off the wax as I can. Now it’s time to purify the wax. It’s come straight from the hive so it’s got hive trash in it – bee parts, and such. So I line a small strainer with a paper towel & put the non-purified pieces into it. I also have a couple of small beeswax processing pots, so I place 2-3 inches of water in the bottom of one of my pots & place my paper-lined strainer of beeswax on top of it. I reserve all my beeswax processing pots and utensils for only this use. It’s near impossible to clean the waxy residue from my strainer & pots once they’ve held melted wax! Melting Beeswax Is Serious Business, Use Caution! This wax is very flammable so I’m always uncomfortable doing this on the stove top where there’s a flame, or even the oven where there’s an electric element for a heat source. 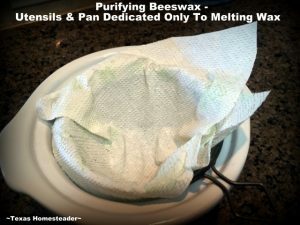 If you decide to try using your stove top or oven to purify beeswax, remember to use extreme caution. Never heat your beeswax directly on a heat source – it’s better to use a double boiler system. Keep the heat low & slow, never leave it unattended. Plus it’s a good idea to have a fire extinguisher handy. Better safe than sorry. And remember sloshing around hot wax can cause serious burns. Keep children & pets out of the kitchen when you’re melting beeswax. Please use extreme caution when melting & dealing with melted wax! Study up on all the dangers before attempting to do this yourself. 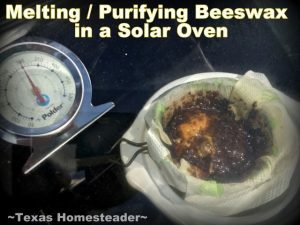 I prefer to use my solar oven for processing beeswax since there’s no heat source other than the power of the sun. I place that pot containing a small bit of water, the paper-lined strainer & raw wax into my solar oven. Then I let the beeswax melt and be filtered through the paper towel. The paper filter removes all but the tiniest impurities while the clean melted wax drips down into the water below. I’ve heard you can save these used paper-towel filters and use them for fire-starters. I’ll totally be doing that for our fireplace this winter! When the wax has been filtered I bring the pot of melted wax inside. As it cools, the wax floats on top of the water and solidifies. It’s pretty cool to watch – I’ve added a sped-up video of the cooling process. Check it out. I remove the cooled, solidified, purified beeswax disk and let it air dry. If it’s clean enough for my liking I move on to the next step for making beeswax molds. But sometimes if too many tiny particles have come through the paper filter I’ll chunk up the solid beeswax & filter it again. I typically don’t worry about a few tiny flecks though. When I’m ready to make the purified wax into cute shapes I chunk it up one final time & place it into a large glass measuring cup that I keep for just this purpose. Back into the solar oven it goes to melt the wax again. When it’s melted I pour the hot melted wax into the molds. I’ve got these cute *Silicone Bee and Comb molds that I use for some of the melts. Or sometimes I use a small *silicone muffin tin for larger beeswax disks. Either way the wax solidifies in the mold & I easily pop them out when they’re cool. The beeswax is now done! I’ve used it for Lip Balm, homemade soap and beeswax wraps. And we’re planning on making beeswax candles this year for our homemade Christmas gifts – how cool! (Note: When I have extra beeswax I’ll often sell it on my Online Store. Anything purchased from our online store helps support this blog. So thank you! So although there are lots of steps between harvest and these cute little decorative lumps of beeswax, I just love ’em! Don’t you? 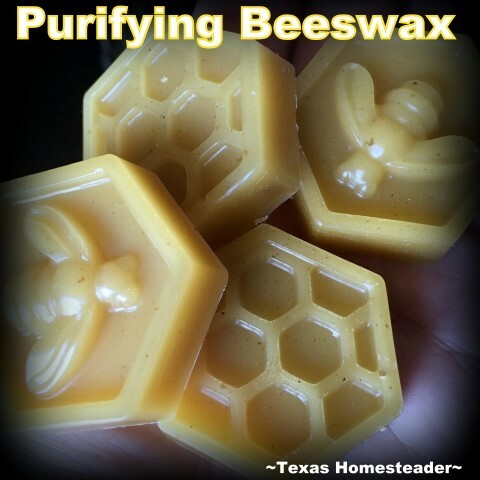 This entry was posted in Blog Posts and tagged Beekeeping on July 29, 2018 by Texas Homesteader. So pretty! I have two hives, and this is my first year beekeeping. I probably won’t get any honey to harvest unless I want to take the fall ragweed and goldenrod stuff (which my teachers say tastes like old socks). I do have a big tupperware bowl of burr comb to render though. This post makes me wonder if I have anything stashed away I could use to make a smaller pellet style wax. I probably only have enough wax to make a couple of ice sized cubes, lol. Thank you for the informative post! I would love to have bees, and have thought about it before. I had a guy come into the school when Kaleigh was in first grade. Your parents probably know him since they’re in the same town. He was very interesting and he offered to bring in a classroom hive, if they wanted the next year. I guess you can see through it and watch the bees.